2005 Le Mans 24 HoursLe Mans, France. 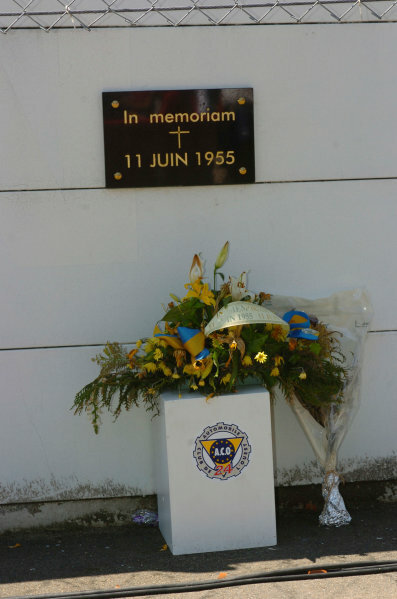 17th - 18th JuneA Memoriam has been placed on the pit straight to remember the accident of 1955. World Copyright: Jeff Bloxham/LAT Photographic Ref: Digital image only. 2005 Le Mans 24 HoursLe Mans, France. 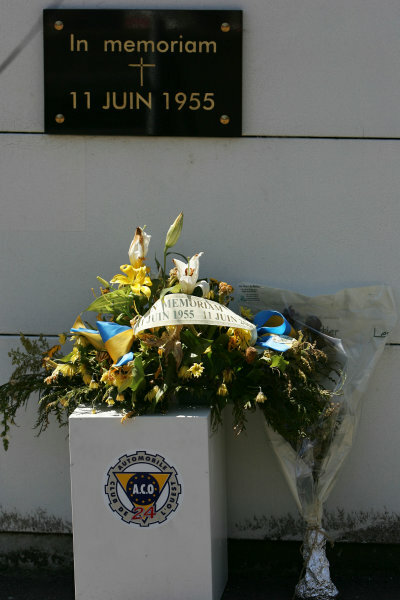 17th - 18th JuneA Memoriam has been placed on the main straight in memory of the accident in the 1955 Le Mans<br /> World Copyright: Glenn Dunbar/LAT Photographic Ref: Digital image only. 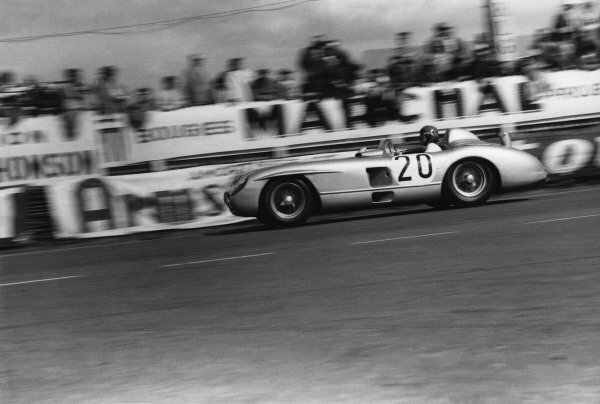 1955 Le Mans 24 hours.<br /> Le Mans, France. 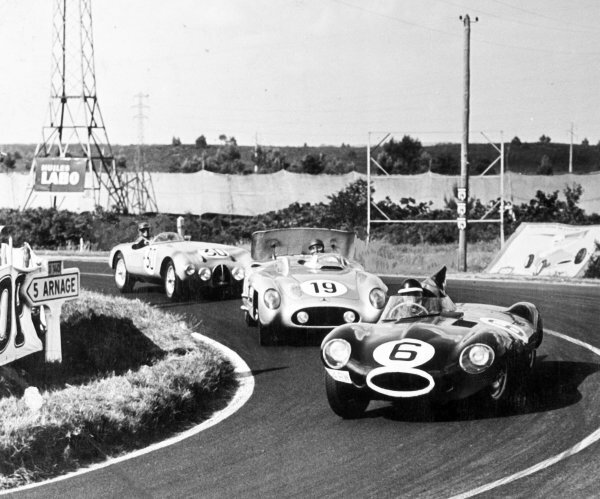 11-12 June 1955.<br /> Mike Hawthorn/Ivor Bueb (Jaguar D-type), 1st position leads Juan Manuel Fangio/Stirling Moss (Mercedes-Benz 300S), retired and Jacques Pollet/Nano da Silva Ramos (Gordini T20S), retired, action.<br /> World Copyright: LAT Photographic<br /> Ref: Autocar Published 30/12/1955. 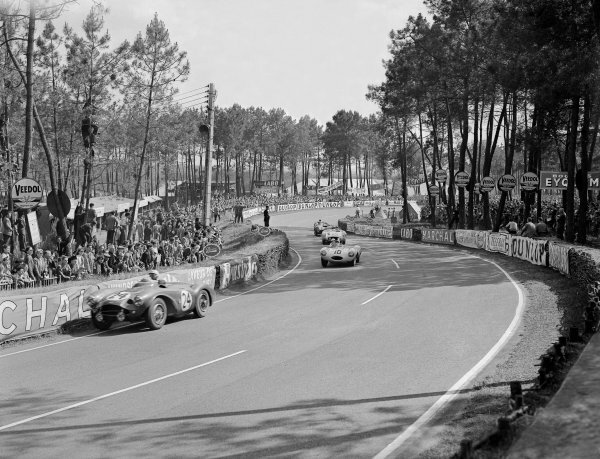 Le Mans, France. 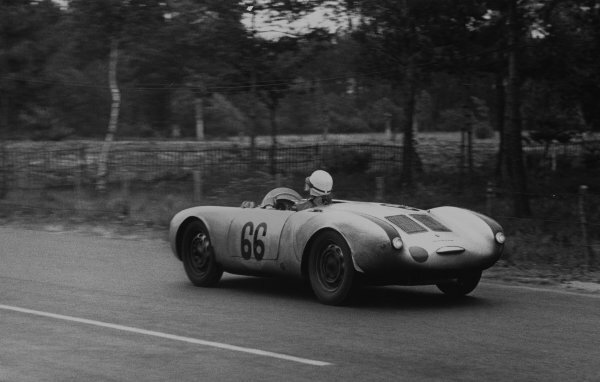 11 - 12 June 1955.<br /> Helmut Glockler/Jaroslav Juhan (Porsche 550 RS Spyder), 6th position, action. <br /> World Copyright: LAT Photographic.<br /> Ref: B/W Print. 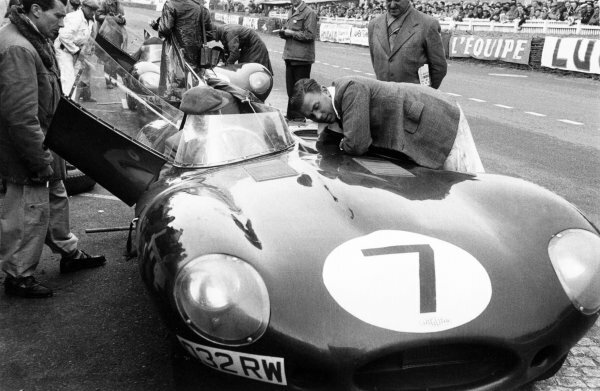 Le Mans, France. 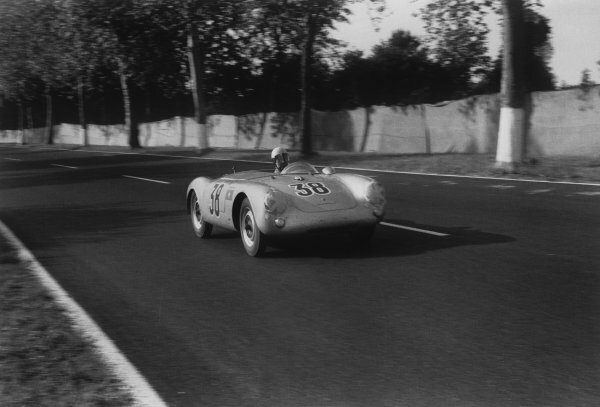 11 - 12 June 1955.<br /> Olivier Gendebien/Wolfgang Seidel (Porsche 550 RS Spyder), 5th position, action. <br /> World Copyright: LAT Photographic.<br /> Ref: B/W Print. 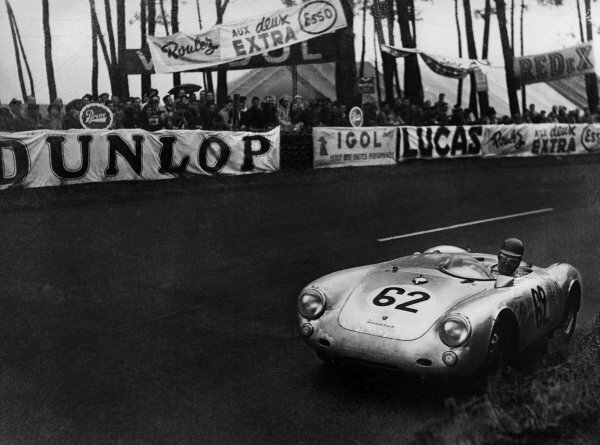 Le Mans, France. 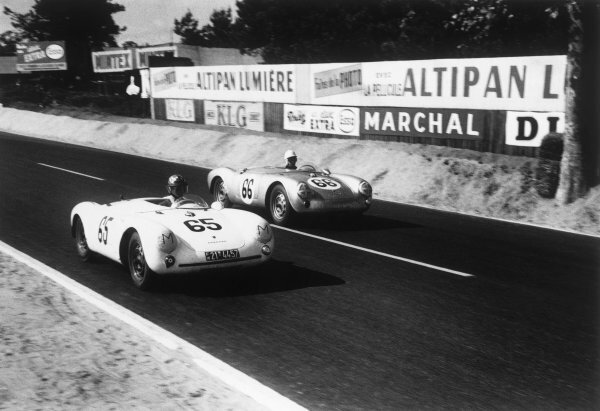 11 - 12 June 1955.<br /> Olivier Gendebien/Wolfgang Seidel (Porsche 550 RS Spyder #66), 5th position, passes Gustave Olivier/Josef Jeser (Porsche 550 #65), 18th position, action. <br /> World Copyright: LAT Photographic.<br /> Ref: 301 - 25. Le Mans, France. 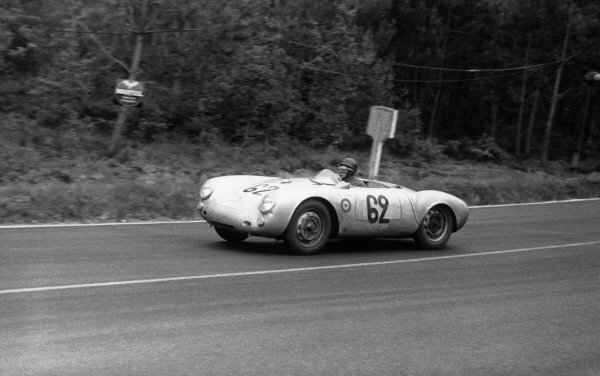 11 - 12 June 1955.<br /> Helmut Glockler/Jaroslav Juhan (Porsche 550 RS Spyder), 6th position, action. <br /> World Copyright: LAT Photographic.<br /> Ref: B/WPRINT. Le Mans, France. 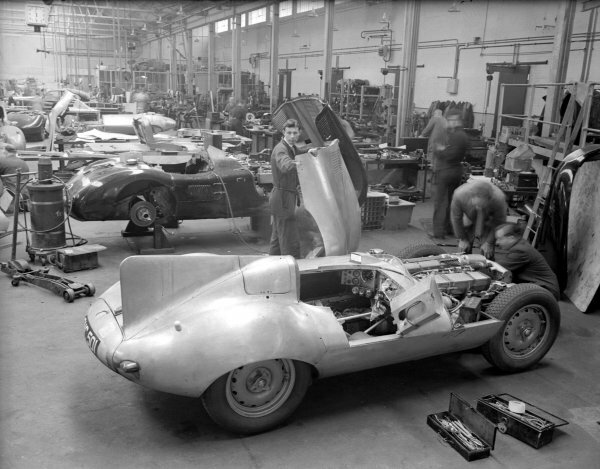 11 - 12 June 1955.<br /> Walter Ringgenberg/Hans-Jorg Gilomen (Porsche 550 Spyder), retired, action. 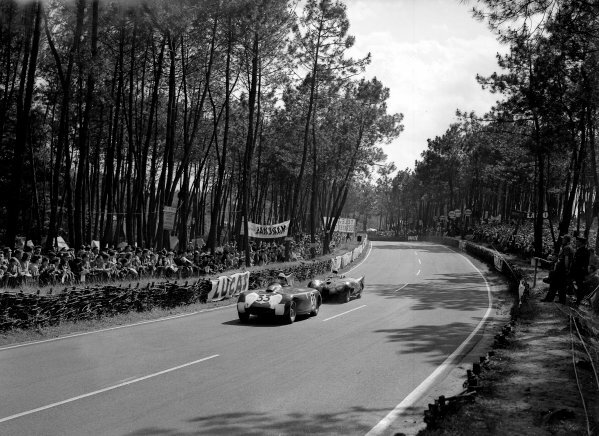 <br /> World Copyright: LAT Photographic.<br /> Ref: 301 - 33. Le Mans, France. 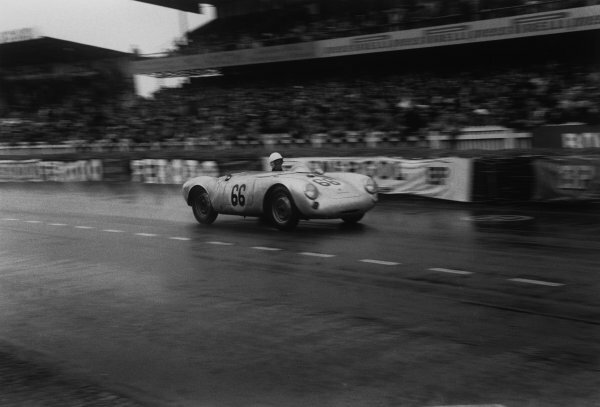 11 - 12 June 1955.<br /> Olivier Gendebien/Wolfgang Seidel (Porsche 550 RS Spyder), 5th position, action. <br /> World Copyright: LAT Photographic.<br /> Ref: 303 - 13. Le Mans, France. 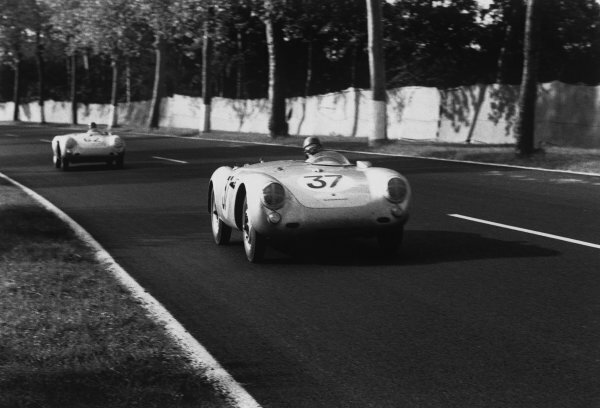 11 - 12 June 1955.<br /> Helmut Polensky/Richard von Frankenberg (Porsche 550 RS Spyder), 4th position, leads Helmut Glockler/Jaroslav Juhan (Porsche 550 RS Spyder), 6th position, action. 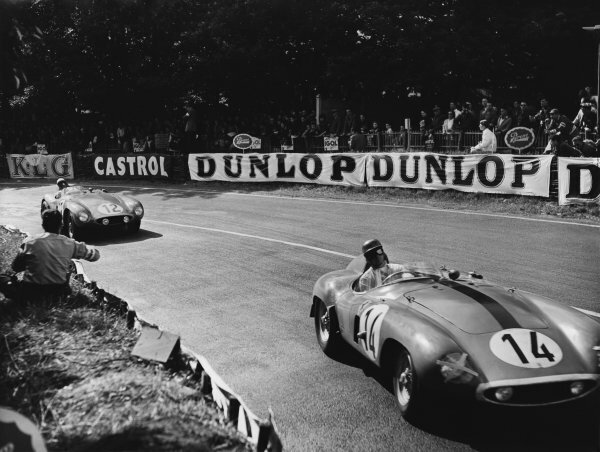 <br /> World Copyright: LAT Photographic.<br /> Ref: 302 - 20. Le Mans, France. 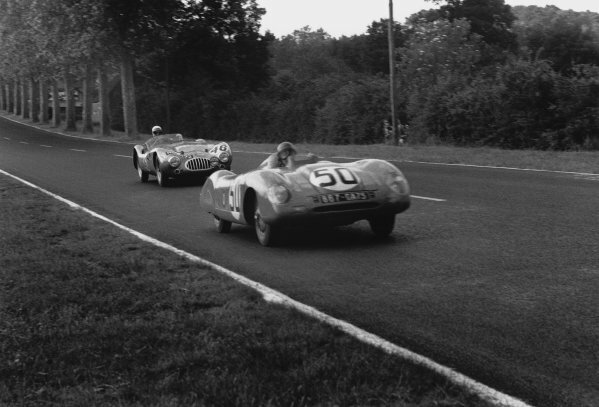 11th - 12th June 1955<br /> Ken Miles/John Lockett (MG A EX 182), 12th position, leads Ted Lund/Hans Waeffler (MG A EX 182), 17th position, action. World Copyright: LAT Photographic<br /> Ref: B/W Print. Le Mans, France. 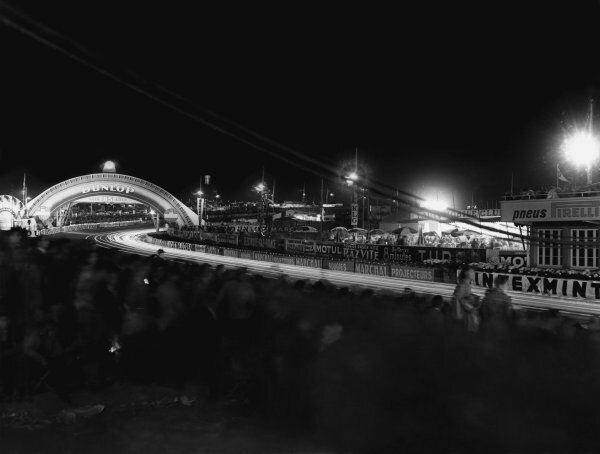 11th - 12th June 1955<br /> The Dunlop bridge at night, atmosphere. 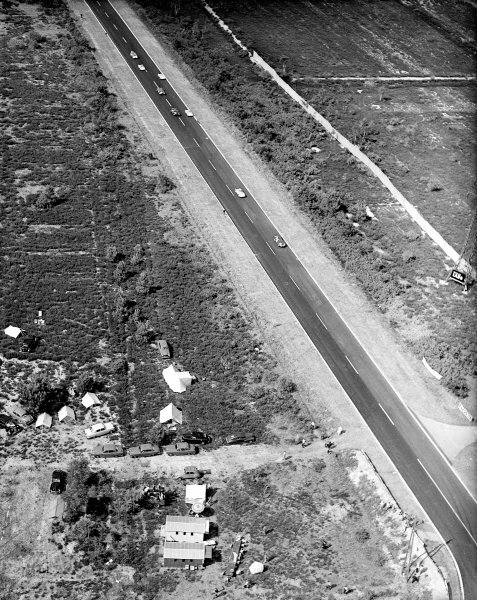 World Copyright: LAT Photographic<br /> Ref: B/W Print. Le Mans, France. 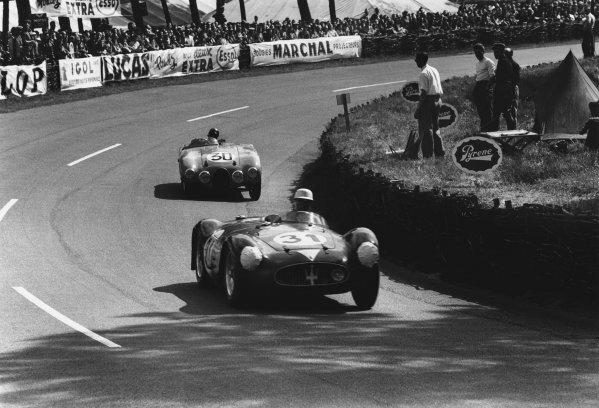 11th - 12th June 1955<br /> Carlo Tomasi/Francesco Giardini (Maserati 200S), retired, leads Jacques Pollet/Nano da Silva Ramos (Gordini T20S), retired, action. World Copyright: LAT Photographic<br /> Ref: 301 - 8. Le Mans, France. 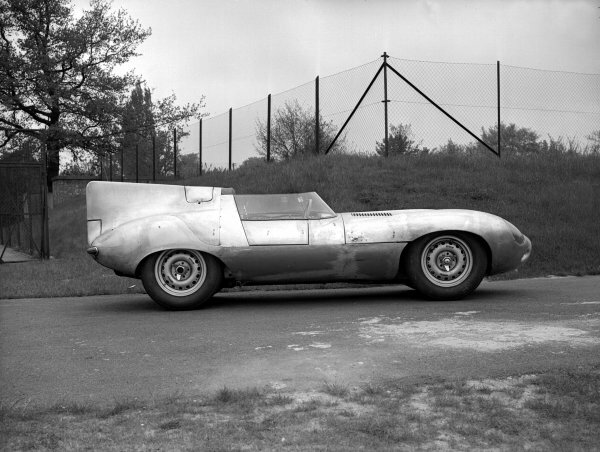 11th - 12th June 1955<br /> Pierre Chancel/Robert Chancel (Panhard VM5 ), retired, leads Alan Rippon/Ray Merrick (Kieft - Climax), retired, action. 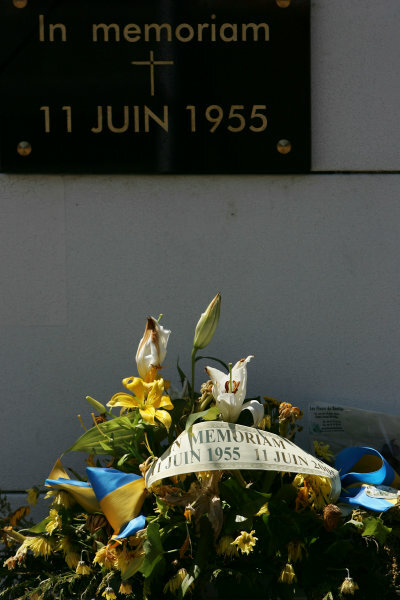 World Copyright: LAT Photographic<br /> Ref: 302 - 7. Le Mans, France. 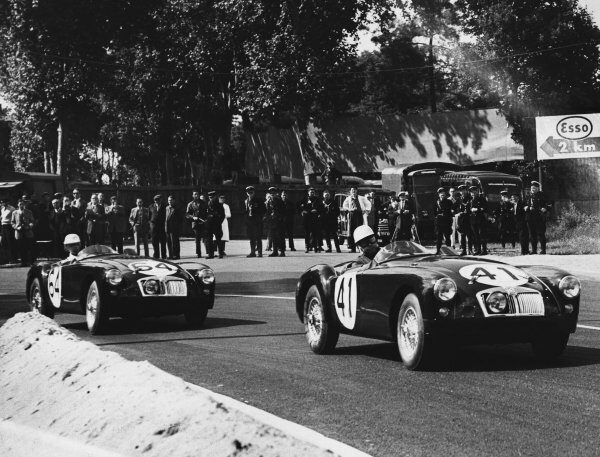 11th - 12th June 1955<br /> Mike Sparken/Masten Gregory (Ferrari 750 Monza), retired, leads Helde/Jean Lucas (Ferrari 750 Monza), retired, action. World Copyright: LAT Photographic<br /> Ref: B/W Print. Le Mans, France. 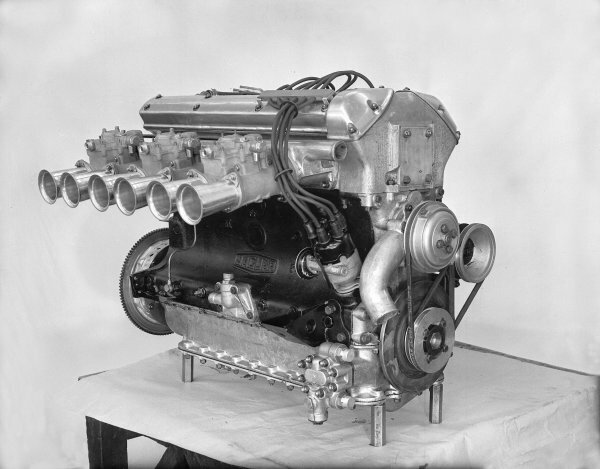 11th - 12th June 1955<br /> Pierre Levegh/John Fitch (Mercedes-Benz 300 S), Fatal accident, retired, action. World Copyright: LAT Photographic<br /> Ref: B/W Print.